Average 2.85/5 out of 26 total votes. DC’s biggest, newest mystery starts here! When a fight between Superman and Mongul crashes into a small Northwestern town, Naomi (last name?) begins a quest to uncover the last time a super-powered person visited her home—and how that might tie into her own origins and adoption. Follow Naomi’s journey on a quest that will take her to the heart of the DC Universe and unfold a universe of ideas and stories that have never been seen before. 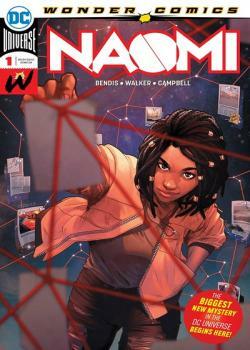 Join writers Brian Michael Bendis, David Walker and breakout artist Jamal Campbell in Wonder Comics’ massively ambitious new series and star...NAOMI.